We rely on donations from individuals like you! The Marin Girls Chorus is a non-profit 501(c)(3) organization. We receive approximately 64% of our operating revenue from earned income like tuition and ticket sales. The Chorus relies on generous contributions from individuals, corporations, foundations and fundraisers to support its quality music programs including need-based scholarships and community outreach performances. Gifts are welcomed year-round and are tax deductible as allowed by law. To make an instant tax-deductible donation today using a major credit card. click here. ​Support us by shopping on AmazonSmile! 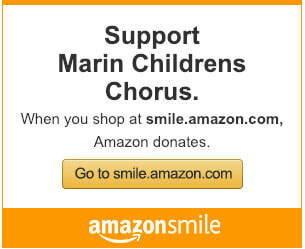 Simply navigate to AmazonSmile instead of Amazon and choose Marin Girls Chorus as the recipient. Same products, same prices, same username and password, but a new and easy way to support the chorus! Click on the link below for simple shopping, simple supporting.